One of my clients asked for help managing a very long list of internal training classes. They needed several hundred classes divided up by department, experience level, and program. A Grouping view is a fast way to make a big list like this more readable. 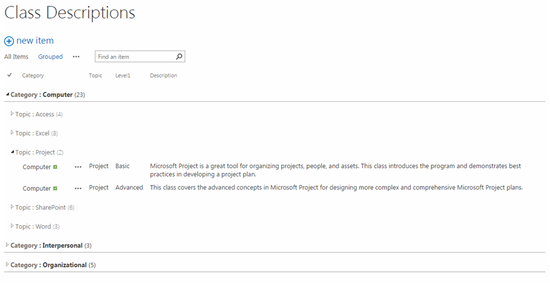 A grouped view hides the content of a list or library until the user expands out the group in which it is contained. 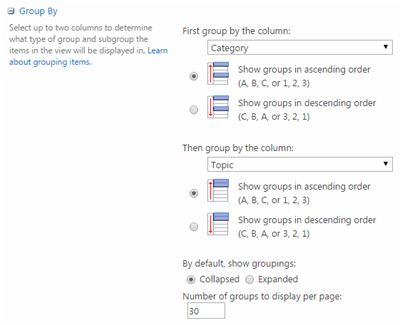 I uploaded some dummy data from Excel into a custom SharePoint list using the Import Spreadsheet web part. The default All Items view (below) is a little too much to look at. It can be filtered by column headers, but a grouped view will have better results. I clicked on Create View under the List Tab and selected a Standard View. There are a lot of ways to customize the views in this screen, but I just used the Group by section. I named the view and then selected the two levels of grouping that I wanted and clicked ok. The result was a much more readable and interactive view of the list.